At Sandy's we take the utmost care of your garments so you can rest assured that your wardrobe is in the best possible hands. Our spotting and pressing departments are owner supervised. We work diligently to remove every stain with the guarantee that if we cannot remove it, no one can. Delicate buttons are removed before cleaning, then replaced afterward. Trims are safeguarded. Hems are repaired as necessary. Knits are measured before cleaning, then blocked back to original dimensions during finishing. Silks receive a mineral oil bath after cleaning to revive the luster and feel. We elevate your clothing to the highest level possible before we present them back to you. 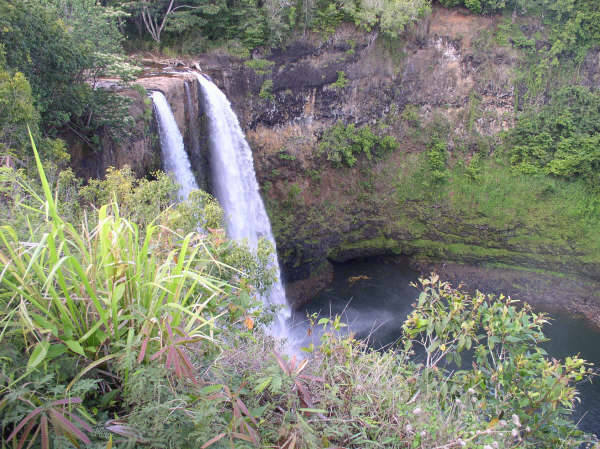 You will be amazed at what we’re doing with water. 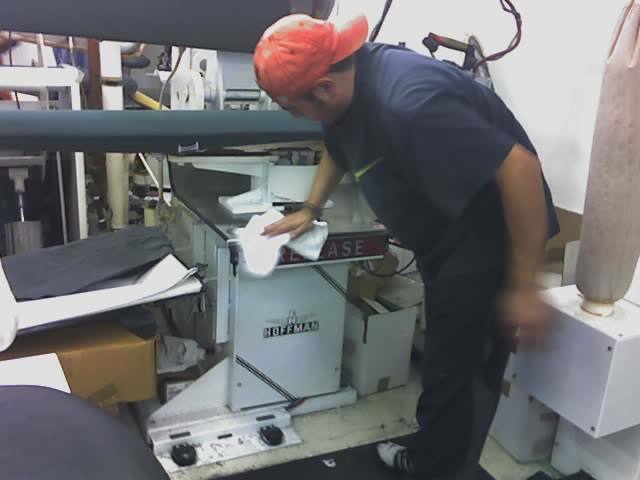 For over ten years now we have been perfecting out skills at a process known as wet cleaning. This environmentally friendly method of fabric care is for the health conscious and “sustainable” minded consumer. Professional wet cleaning is an alternative fabric cleaning method that uses specially formulated aqueous (water-based) solvents. A highly experienced dry cleaner can clean up to ninety percent of pieces labeled “ dry clean only” by this method and do a better job in most cases. The fabrics come out smelling fresher and feeling softer than in traditional dry cleaning. Whites are whiter. Colors are more brilliant. There are no toxic chemicals used in this process. Instead specially designed biodegradable detergents and conditioners are used. These additives prevent shrinkage, insure dimensional stability, prevent pilling, and enhance color. There is neither hazardous waste produced nor ozone depleting gases released into the atmosphere. Time, temperature, mechanical action, and residual moisture need to be strictly controlled in this process. It’s not a procedure to be used by an amateur, but when done correctly it’s the best process on and for the planet. Let us show you. We will steam and hand finish your gown to perfection ,remove any minor stains, and dress it with a form to hold it's shape, in preparation for your wedding day. After the wedding is over we really go to work. The gown is carefully inspected for stains. We address the soil at the hem line. Oil must be removed before it oxidizes. Reducing sugars must be removed before they caramelize. When we are satisfied that the gown and accompaniments are absolutely pristine, we pack the dress in an acid free keepsake box for protection and storage. Your dress well be ready to be passed down to the next generation when we are through with it. Our laundry process is carried out in tepid water. 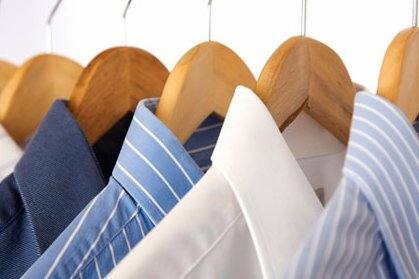 We have found that repeated washings in warmer water shrink the collars of some shirts and blouses. It takes more time effort to get the collars clean in colder water but we have know the biodegradable products to do the job. The shirts and blouses are then pressed and hand finished to perfection. Broken and missing buttons are replaced. Minor repairs are preformed at no charge. The collars are supported with plastic to prevent crushing in transit, which we’re happy to have back and recycle. Hung or folded it’s at it’s best. A garment finisher has the skilled touch necessary to produce a superior product. Our finishers take the time and have the pride to form the garments without unsightly marks from inside showing through. Our pants have a sharp crease without the impressions from the side seams showing. 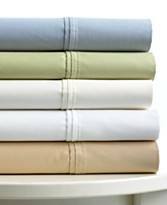 The linen and cotton blouses have just the right amount of conditioners to stay crisp but soft. Our silk shirts and blouses are wrinkle free but soft and flowing. They receive a mineral oil bath after cleaning to revive the colors and renew their natural softness. Next they are finished on a European finishing board as they float over a cushion of air. Knits are measured before cleaning and blocked back to their original dimensions afterwards. Our people like their jobs and enjoy creating an exquisite product. As in most things,experience and knowledge make the difference. Our tailor, Linda, has the skill level to accommodate your every need. She can outfit a bridal party or get you ready for the ball. She is patient and a pleasure to work with. Specialty items such as blankets, bedspreads, comforters, duvet covers, throws and sleeping bags merit an equal amount of detailed attention when being cleaned. Professional cleaning will maintain their rich, saturated color and the down interior of those items will be rejuvenated. 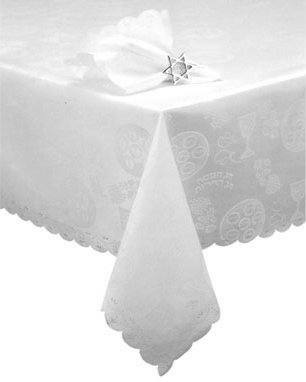 Tablecloths, because of their size, texture, and fabric, can be difficult to clean and finish at home. Many times stain removal is a challenge. You can keep your tablecloths and table linens clean and fresh throughout the year by entrusting them to our professional staff . It feels great to lay down in a bed where the sheets and pillow cases are crisp and fresh. We hand finish these items so there are no wrinkles at the fitted corners. 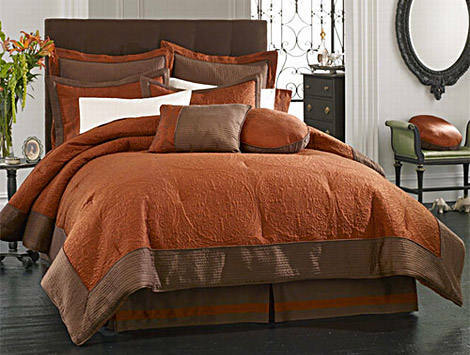 You will sleep comfortably on a bed made up with linens cared for by Sandy's. 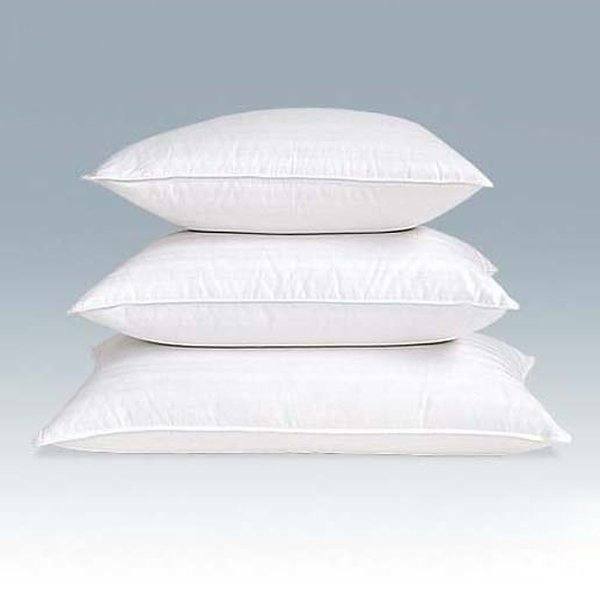 Freshly wet cleaned, sanitized, and fluffed feather pillows are the perfect compliment to newly laundered bed linens. Treat the royalty in your castle to the comfort of clean crisp bedding to melt into after a long day. Doing the laundry is your basic household chore. Too bad your job or other responsibilities leave you so little time to get it done. Bring your laundry workload to Sandy's , because we do laundry as well as we dry clean! It will come back clean and neatly folded, with a freshness you'll appreciate every day. Try our Fluff & Fold Service Today! Leather,suede and fur need care that is different from normal dry cleaning. We use a specialty house that knows how best to restore these items to their original finish. After dry cleaning, garments are sprayed with a neutral oil and or dye to restore the original look and feel. It takes about three weeks for processing but it's well worth it. Oriental and Persian rugs are processed by a company which sells, repairs, and restores these valuable art treasures. Pet stains are removed. Color bleeding is controlled. Stain guard coating is also available. Please allow three weeks for processing.